As one unpacks the idea of WHERE I Am, there are actually several components acting in concert. There is, of course, my physical presence, but there is also the dimension of geography. WHERE I Am is actually a combination of two places: mine and the geographic location I happen to be occupying at any given moment. With or without ME, the geographic location still exists. In addition to this physical topology, humanity has also created a globe-spanning built environment of schools, bank, homes and many other structures. Shouldn’t FourSquare, Gowalla and Places “Check In” with ME? So, when Places asks me to “check in,” it is actually triangulating three components: geography, structures and ME. In all three cases, this “data” does not belong to Google, Facebook or any other web site. Just because Google takes a picture of something from the Street doesn’t change the ownership of the structure. Just because Facebook has uploaded all sorts of business addresses into its databases doesn’t mean the locations magically appeared or that I must manage my location from their website. WHERE, like WHO, belongs to ME. So, if the locations are already there, then trying to figure out whether Foursquare, Gowalla or Facebook is the best path to manage my geolocation services seems to be the wrong question. Regardless of which of these sites I choose to use as my viewer, whatever choices I make about my geolocation should be available across websites. That is the heart of ME 1.0, as opposed to Web 2.0. If I start with ME, then the walls of the Web come tumbling down. As a future posting on another of the CLOUD axes will discuss, WHERE I Am can also be WHO I Am. For example, let’s suppose Google’s Street View is showing us a school. Obviously, part of this geographic location relates to the structure, but the school’s “tag cloud” isn’t limited to just where it is. The school is a sort of “flowpoint.” It is not just a geographic tag but actually a “nexus” of numerous “threads” flowing through it. At the same time that students and teachers enter the building, there is another “flow” of data occurring, one related to learning rather than location. 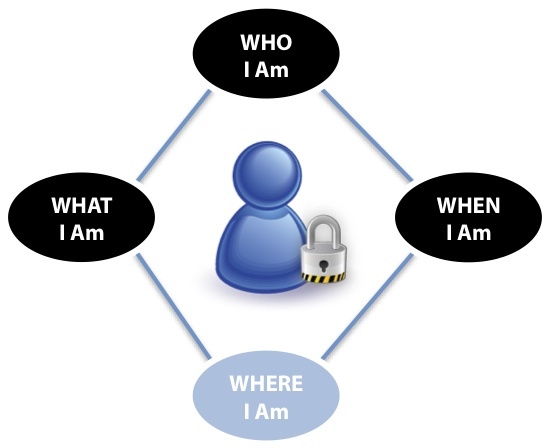 The concept of WHO will be discussed in more detail in an upcoming WHO I Am™ CLOUD Dimensions posting. The concept is also discussed in the video vignette on our home page, CLOUD and the Power of WHO. Getting back to WHERE I Am, though, there is one more facet of this concept worth considering. The physical world and the virtual world are simply not the same. As discussed in my personal blog, The End of Linearity, there is no “there” on the Internet. Web destinations are not the same as a street address. A URL is merely a pointer; latitude and longitude are real. URLs can move and change; locations don’t. And, in the world of the Internet, I can be everywhere, anywhere and nowhere, all at the same time. And no matter WHERE I Am, CLOUD’s language will make it about you and the local ownership and use of your data, of which where is but one more axis that makes you, you.